The Holocaust left over half a billion people dead. The Bangladesh War of 1971 killed nearly 3 million people. Up to 800,000 were killed and nearly 200,000 displaced in the genocide that occurred in Rwanda in 1994. Even today, genocide occurs in Sudan, Darfur, North Korea, and other places around the world. All these people that have died because of genocide still matter because their deaths remind us of how cruel, dangerous, and horrifying genocide can be. Though all these people are victims of genocide, their bones still remain. The Rwandan Genocide started when the then Rwandan president’s plane crashed and he died. The president was a member of the Hutu party. The Hutus were angry and unreasonably placed blame on the Tutsis, the opposing party, and as a result started killing everyone who was marked as a Tutsi on their ID card – men, women, and children. Claude Kaitare (pictured above) is a survivor of the Rwandan genocide who came to the U.S at the age of 14 to escape the Rwandan Genocide. One of the reasons he was able to escape was because he didn’t have an ID card. He resides in Massachusetts and came to speak to students at Andover about genocide. Right now, the students and teachers of Andover High School are undertaking a project called the “Bones Remain” to raise awareness of genocide and how atrocious it can be. I sat down with Ms. Friske, coordinator of this project (as well as the photography teacher at AHS), to get some details. I based the project off of a project called “One Million Bones” which was done in Washington DC and that was a nationwide project. They asked teachers and students from around the country to create ceramic bones and send them to D.C. What they did then was they laid the bones out in front of the Washington National Mall and basically used them to protest what’s happening in Darfur and what’s happening in Sudan. This was a specific choice of location too, because the bones being placed in our nations capital is a way of protesting without picketing and shouting. It was also a way for people to use art as part of a healing process. So refugees created bones and laid them out – Somalian refugees, Holocaust Survivors, Rwandan Survivors. There are ways you can use art to get people to be aware of things and I wanted to do that at Andover. 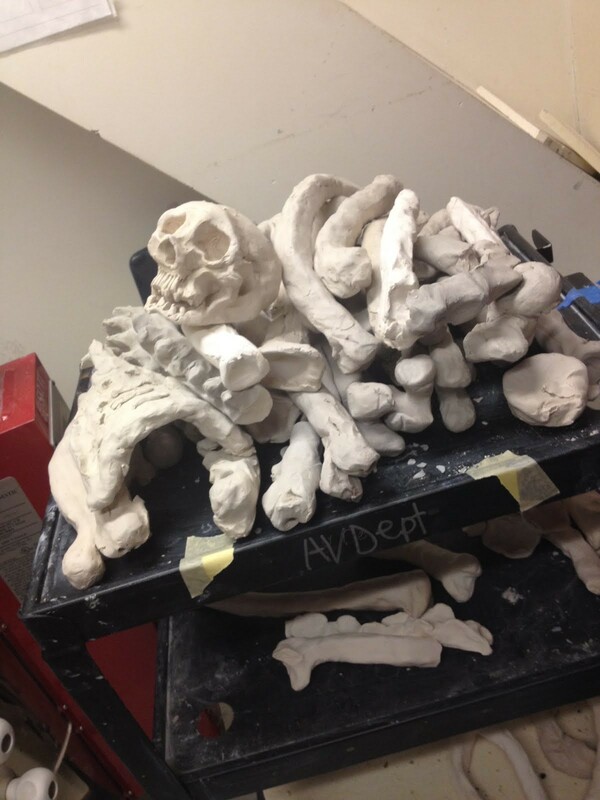 Ceramic bones created by students that will be displayed in foyer as part of the “Bones Remain”. What’s the plan for taking on this project at Andover? I reached out to Mr. Gibson, history teacher, and Ms. Dunning, the ceramics teacher, and I wanted to do a cross disciplinary collaborative project for both teachers and students in these three disciplines, so really bringing together art and history. I wanted to this at Andover, not only because it was an active project that brought different classes together, but to raise awareness of genocide here. Actually, April of this year was the twentieth anniversary of the Rwandan genocide. The bones represent victims of all genocide but because of the fact that it was the twentieth anniversary of the Rwandan genocide this year and the fact that there are still genocides and mass atrocities occurring today, I wanted to bring awareness to these genocides in specific. Where do you plan on putting the bones once they’re finished? Last week of May, first week of June, we’ll be installing them in the main foyer so that when people walk into the building they’re really going to be confronted with this. We really wanted it to be in a public space that most people can see everyday. Also, we’re going to be having not only the bones there but we’ll also be putting up responses from people who have participated in the project. So, they’ve written what genocide is and how they could maybe help genocide to stop. 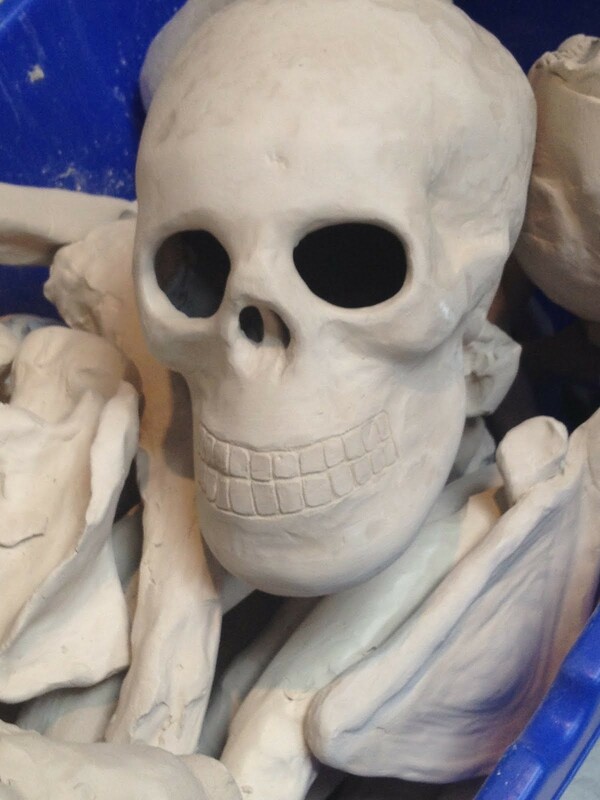 Ceramic skull, courtesy of AHS students. How are the classes/students getting involved? They’re making the bones that will go on display and at the same time learning about genocide. Also, I teach photography, and a major component that I brought together with my advanced photography class is that we studied documentary photography and how that plays a role in showing people what’s going on in the world. So my students in my advanced class did artists presentations on photographers that have photographed while a genocide is occurring or after the fact, going back years later, and doing portraits of people who are still living with the aftermath of the genocide. Some of the artists they did presentations on were Pieter Hugo, Jonathan Torgovnik, and Margaret Burke White. The history classes are also sat in on the presentations and wrote responses to the presentations. We asked the students what group of images [that the artists did] they were most impacted by and what left a mark on them the most. Some of them were shocked, some of the were surprised. I think that overall they gained a deeper understanding of the experience of both the perpetrators and the victims. Not all of the images [taken by the artists] were about shock value, some of them were about the story of the victim or the perpetrator. How are you funding the project and what’s the long term plan for it? We’ve received a grant from the Andover Fund for Education. We applied for it and we received it. The project will be on view, [and] it will travel from the main foyer of AHS to the history section in the Memorial Hall Library. So it’s going to be on view there for the month of June. The bones will be there and we’ll also be displaying some photographs of the students working on the bones. Also, we have some photographs of the aftermath of Rwandan Genocide that we’ll be displaying there. Basically these images show how bad the genocide was. You can see the cracks in the skulls from the machetes and the bones tell you the story of how brutally these people were murdered. 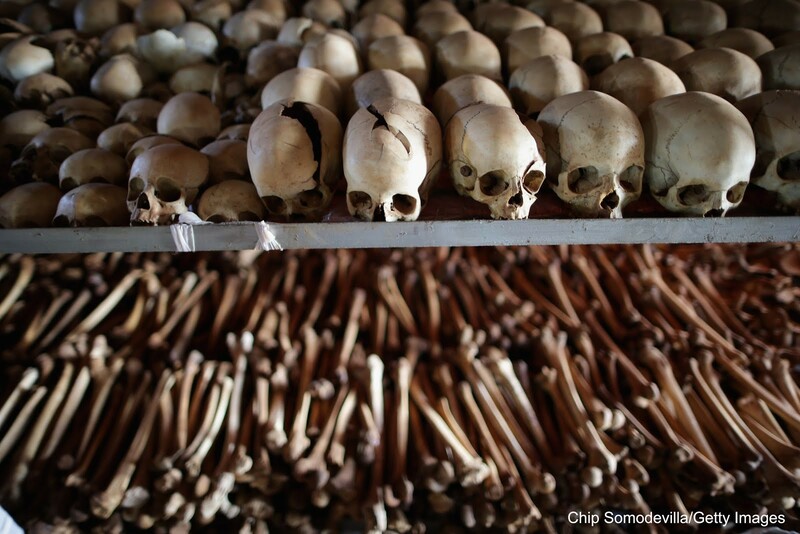 Aftermath of the Rwandan Genocide. The Bones will be on display at Andover starting May 23rd and will be on display at the library starting June 9th. Also there will be a reception held at the Library on June 12th from 6-7pm for the project. Please mail donations: Make checks or money order payable to “YouthBuild – Rwanda Project”. Mail to: RYHC c/o John Bell YouthBuild USA 58 Day Street, Somerville, MA, 02478. More information at www. rwandahealing.org. Next Next post: WIN Fall Out Boy, Paramore, and Panic! At the Disco Tickets!